Website editor’s note: The information below is a press release for a new campaign in New Zealand to encourage pregnant mothers to sleep on their side (not their back) from 28 weeks onwards during their pregnancy. Sleeping and resting on one side (rather than lying on the back) ensures that the blood flow to the developing baby is optimised and reduces the risk of stillbirth. From today, pregnant women in New Zealand will benefit from a public health campaign providing vital information that could reduce the number of stillborn babies during late stages of pregnancy. 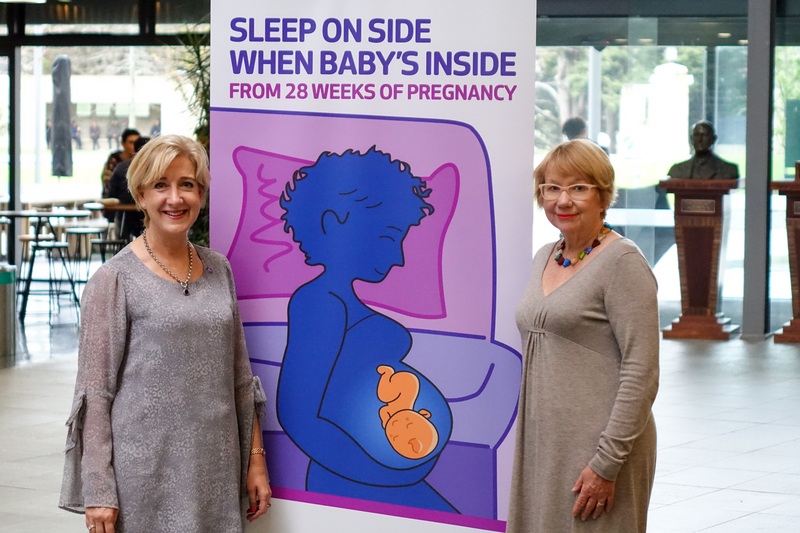 ‘Sleep on Side; Stillbirth Prevention Campaign’ #sleeponside is rolling out nationwide and advises expectant mums to sleep on their side from 28 weeks of pregnancy. The campaign has been developed by the University of Auckland and Ministry of Health, in partnership with child health research charity Cure Kids, following new evidence that has the potential to save lives of approximately 16 unborn babies a year in New Zealand. Professor Lesley McCowan, Head of the University of Auckland’s Obstetrics and Gynaecology Department, who leads the initiative says; “While it’s been common for women to be advised to sleep on their side when pregnant, a decade of research carried out in four countries across different ethnicities, has now confirmed, the very consistent association between going-to-sleep position and stillbirth”. Lying on your back from 28 weeks presses on major blood vessels which can reduce blood flow to the womb and oxygen supply to the baby. Approximately 1 in 20 women in New Zealand go to sleep on their back in the late stages of pregnancy. The Sleep on Side campaign raises awareness of the increased risk of stillbirth for such women and encourages a change in the sleeping position from 28 weeks of pregnancy. Each year, in New Zealand, approximately 160 babies are stillborn in the last three months of pregnancy. It’s estimated that if all pregnant women go to sleep on their side from 28 weeks of pregnancy, there would be a 10 percent decrease in late stillbirths nationally. Internationally, this change in sleeping position has the potential to save up to 100,000 babies a year. Professor McCowan, and her team of New Zealand researchers, have been at the forefront of international research looking at risk factors for stillbirth for nearly 10 years. The conclusion from four studies – two by Professor McCowan in New Zealand, one in Australia and one from the UK – which analysed more than 800 late pregnancy stillbirth cases, reveals a 2.5 to 6-fold increase in the risk of late stillbirth if women go to sleep lying on their back. “We can now confirm that going to sleep on either your left or right side halves the risk of stillbirth compared with going to sleep on your back. We’re hoping this new information will have significant impact in changing habits,” says Professor McCowan. “The good news is that the going-to-sleep position has changed in recent years, with more New Zealand mums already taking heed of advice to sleep on their side during pregnancy. We anticipate a further increase in expectant mothers changing their sleep behaviour thanks to this campaign,” adds Professor McCowan. The campaign resources – brochures for pregnant women and health professionals and a social media video, featuring a voiceover by broadcaster Miriama Kamo and music by award-winning musician Claudia Gunn – are simple in their messaging, yet could make a huge difference for Kiwi families. Vicki Culling PhD, a bereaved parent, whose first daughter was stillborn at 10 days overdue in 1998, has since been supporting bereaved parents and families and educating health professionals on pregnancy, baby and infant loss. Culling has worked alongside Professor McCowan and Cure Kids as the Project Coordinator on the ‘Sleep on Side; Stillbirth Prevention Campaign’. The advice to pregnant women during the third trimester is to go to sleep on their side for every sleep, including; going to sleep at night, returning to sleep after any night-time awakenings and day-time naps. Cure Kids has supported the programme of research that has provided the evidence for the ‘Sleep on Side; Stillbirth Prevention Campaign’ since 2007, enabling New Zealand researchers to lead the way with these internationally significant findings. “We’re delighted to see all this research result in tangible evidence which will provide future parents in New Zealand with important information for improved sleep practises during pregnancy, in order to change the stillbirth statistics,” says Cure Kids CEO Frances Benge.